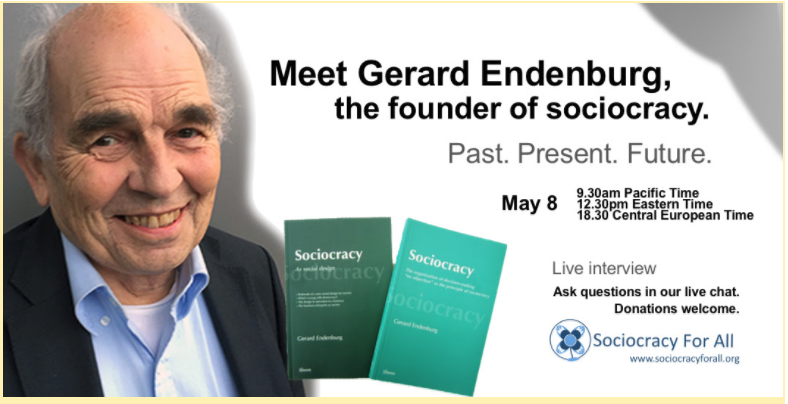 Tracy and I enjoyed a rare opportunity to participate in an online conference call with a person who has had a profound influence on our work in the world, the founder of sociocracy, Gerard Endenberg. Sociocracy literally means “rule by the ‘socios,’ or ‘people with a social connection.’ Socios in Spanish means partners. Rule by the socios is a special form of “rule by the demos” or democracy. “Demos” means the general mass of people who may or may not know each other. Our good friends and colleagues at Sociocracy for All hosted this conference call and have posted the recording so that as many people as possible have the opportunity to hear Gerard tell about the past, present and future of this system of socially responsible governance, designed to mimic healthy systems in the natural world. Circle Forward co-founder, John Buck, brought sociocracy to the English-speaking world with his great book, We the People: Consenting to a Deeper Democracy. Tracy and I both participated in trainings with John Buck that transformed our work. In fact, that’s also how we met! John is in the process of writing a new book with Jutta Eckstein, and the draft is published on leanpub: Company-wide Agility With Beyond Budgeting, Open Space, and Sociocracy: Survive and Thrive Disruption. 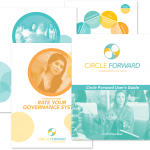 Circle Forward’s collaborative decision-making package sprouts directly from sociocracy; and, so much about the world has changed over the last 40 years, and the pace of change is quickening! We have found that many of the principles of sociocracy are still essential for good governance in the 21st century, but other principles are also essential. We founded Circle Forward to be a collaborative governance system oriented toward networks, organizations, and businesses who have a social mission, and who are driving large-scale systems change; and, we are identifying, and continuously developing, a set of governance principles for these contexts. It was a real honor to be present with Gerard Endenberg, Annewiek Reijmer, the CEO of The Sociocracy Consulting Group, and so many colleagues from the global sociocracy community. You can watch the recording here.